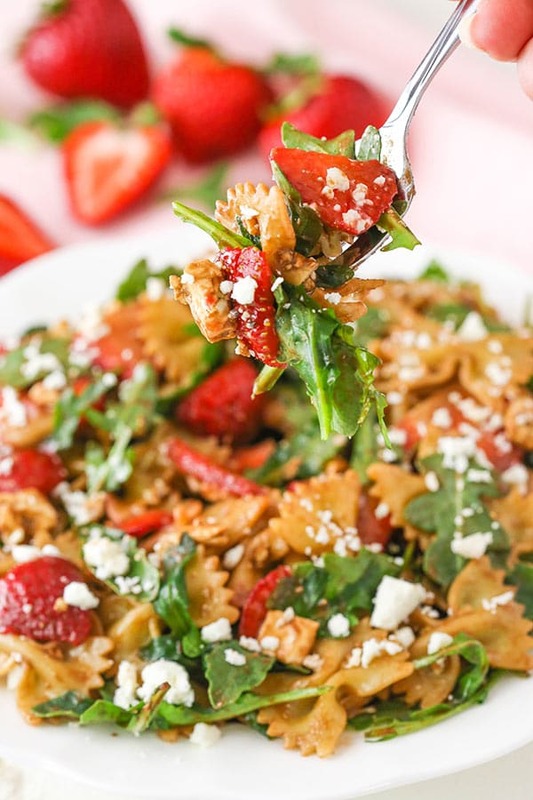 This Strawberry Feta Balsamic Pasta Salad is easy to make, fresh and delicious for summer! It’s so many of my favorite things in one! So life has been pretty status quo these days. The boys are officially 4 months old and it’s crazy! They are smiling and cooing away and generally being pretty adorable (when they aren’t crying, lets keep it real). They are sleeping through the night now and it kind of feels like we’ve left one stage and entered another. While it’s a great feeling to be moving along, it’s also hard to know you’ll never go back. I’m trying to soak up as many of their snuggles and coos as I can before they’re gone. However, that means little time for much else. Between working and being with the babes and hubs, I’m lucky to have an hour to do something for myself. When I have one, it’s often used for a shower. No, I’m not kidding. So I’m all about some easy foods lately. Enter this pasta salad! It is super easy to throw together! 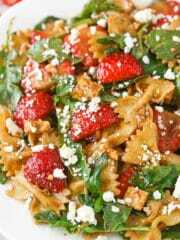 Being big fans of strawberries, feta, balsamic vinegar and arugula, the hubs and I naturally love it. The hubs kind of devoured it, actually. And if you wanted to make it a little heartier, you could totally add some chicken. Yum! 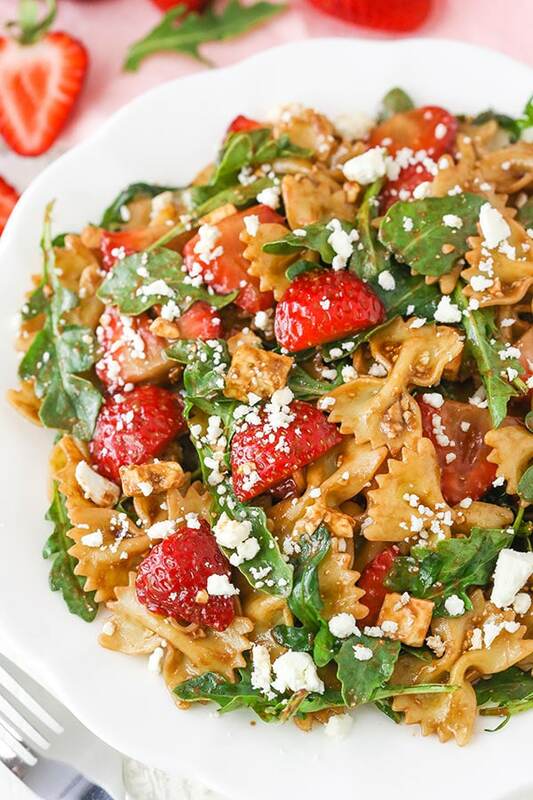 So even though this Strawberry Feta Balsamic Pasta Salad is super easy to make and really doesn’t require too much explanation, let’s talk about it a bit, k? The pasta is cooked first and you could totally use another kind of pasta if you wanted. I personally love the look of the bow tie and I think it works really well here. It doesn’t feel like as heavy of a pasta as something like a penne, but it’s more substantial that a macaroni noodle. I’m a fan. The strawberries are also the jam in here! So fresh and perfect this time of year too. 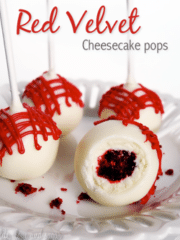 Talk about awesome flavor and perfectly sweet without needing to add anything. Love me some fresh berries! And feta? I think I could just eat a big block of feta. Boy do I love the stuff. 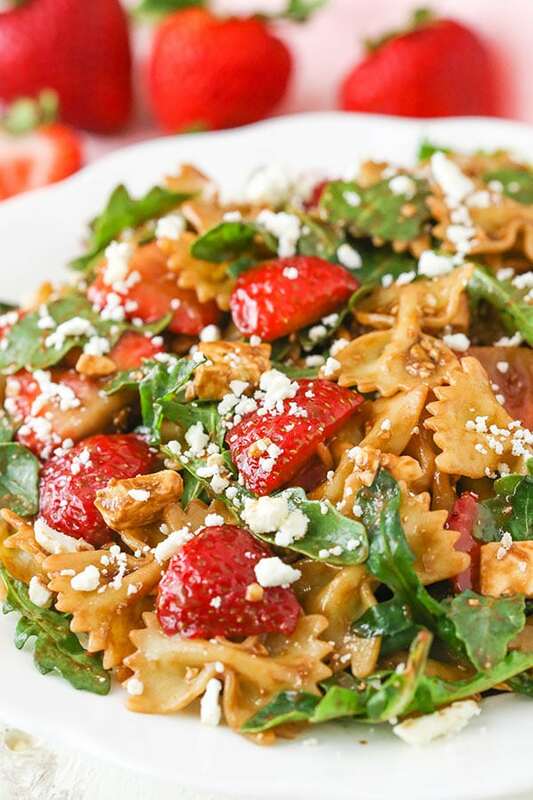 It’s also fantastic in this pasta salad. 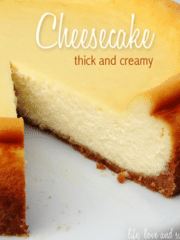 One of the great things about this recipe though is that it’s easy to switch it up. The hubs thinks goat cheese could be good with it and it’s something you could easily switch around to try your favorite cheeses with. Then the arugula. It seems odd to me that lettuce is so good with pasta, but it totally is. There’s this pasta/salad combo at a Greek restaurant in our area that I’m obsessed with (also covered in balsamic) and the first time I had it, I was surprised by how much I liked the combo. I decided to go with arugula here because it’s one of my favorite greens and the flavor is great with the balsamic, feta and strawberries. That said, if you prefer another green – such as lettuce or spinach – you can totally swap it out. Everything is covered in balsamic glaze, olive oil and a little salt and you’re done! Seriously so easy and so adaptable. Such a great thing to put together at the beginning of the week and pull out to snack on when you only have like 15 minutes before two babies wake up and scream for another bottle. 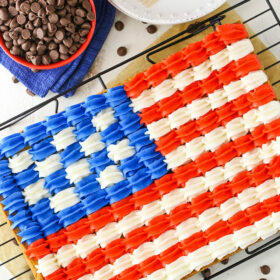 Or to take to a potluck or BBQ. Whatever. 1. Cook the pasta according to package instructions. Drain and allow to cool. 2. 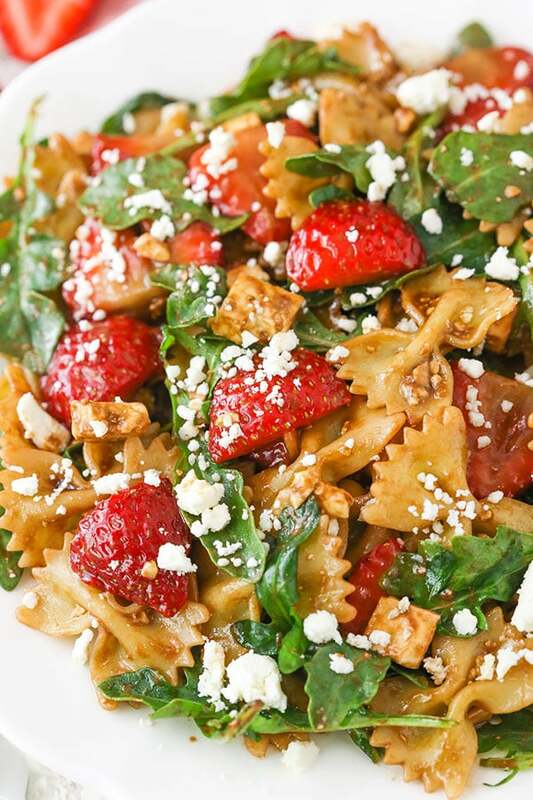 Add the pasta to a large bowl and add the sliced strawberries, feta cheese and arugula. Toss everything together. 3. Add the salt, balsamic glaze and olive oil and toss to coat thoroughly. 4. Serve or cover and store in the fridge for up to 4-5 days, or as long as the strawberries last. It is, yes. It’s more concentrated and thicker. You find it by the balsamic vinegar and olive oils, it’s just in a little smaller container. It’s like this one. What kind of balsamic glaze do you use and where do you find it? You find it by the balsamic vinegar and olive oils, it’s just in a little smaller container. It’s like this one. 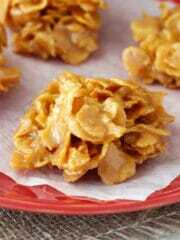 I made this as an appetizer for dinner yesterday and it was SO good! I didn’t have balsamic glaze so I just made some with a recipe I found on AllRecipes. I used 1/2 C balsamic vinegar and 2 T brown sugar and reduced it on the stove until it was thick like a glaze. It turned out perfectly! Thank you for sharing! 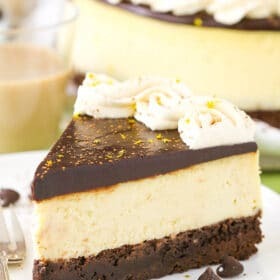 This recipe was absolutely delicious! It will be a go to recipe for sure. So easy to put together. I’m so glad to hear that! Thanks Tina! Made this last week and I’m loving it! 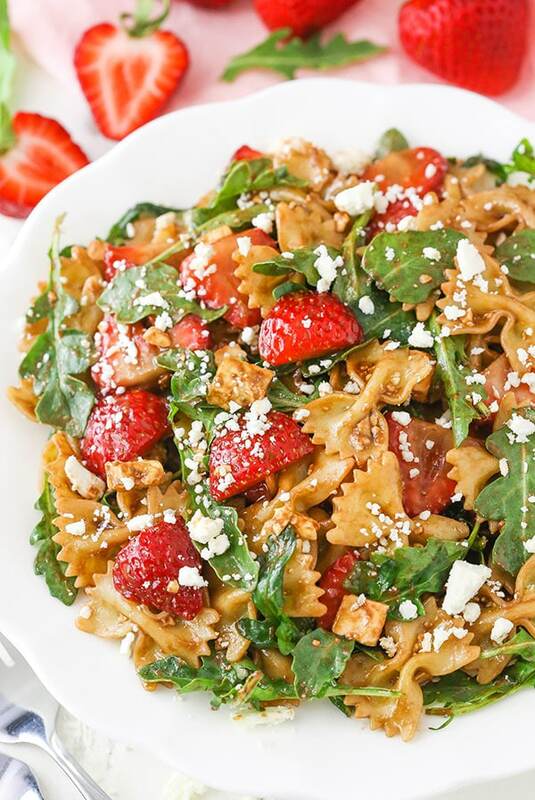 A great way to use up extra strawberries.